The Philadelphia Lacan Study Group is running a monthly reading group through the fall and winter. Led by Patricia Gherovici, the group explores interpretations of madness in contemporary culture and the clinic. 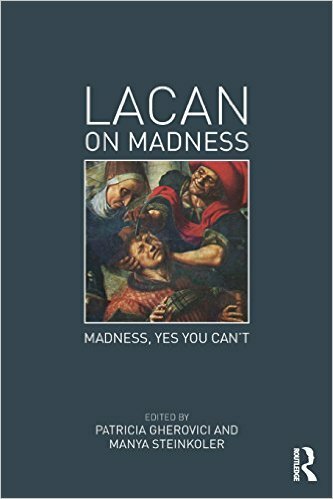 2015 saw the publication of a new volume of essays by Lacanian analysts, critics and philosopher re-examining madness and psychosis a half-century after Lacan’s famous seminar on the psychoses: Lacan on Madness: Madness, Yes You Can’t! An intimate but dedicated and heterogenous group of analysts, students, and interested individuals meet every few weeks at the Kelly Writer’s House in Philadelphia to discuss the volume’s essays, which range from clinical case studies to political meditations, from aesthetics to general theories of insanity. 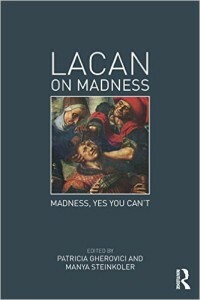 The discussions are intellectually open: they are neither restricted to a Lacanian vocabulary, nor strictly didactic, but rather aim at prompting actual thinking about the place of madness in our contemporary cultural field and the role of psychoanalysis in approaching this locus. For example, a recent reading of Richard Boothby’s essay on suicide bombers led to a consideration of the differences between “psychologizing” terrorism, which explains away and thereby avoids social problems, as opposed to the strategic deployment of psychoanalysis to understand and critique the fantasies that allow disastrous events to be captured by the political machine of the capitalist status quo. The group does justice to the use of the word “madness” in the title of the volume, in allowing the word to sound in all of its resonances, unworking the various strict technical interpretations built up around diagnostic categories in order to investigate the fundamental and often irresolvable questions hidden in the foundation of the concept. While Lacanians have their positions — as do all groups — it is true that they are generally the most intellectually open of psychoanalytic orientations. In almost every major city in the U.S., one can find a psychoanalytic reading group or seminar run by Lacanians that is free and open to the public. In this sense, Lacanian groups like the Philadelphia Lacan Study Group are salutary for the revival and regeneration of psychoanalysis in general, insofar as they continue to create spaces for thinking outside of the academy. If you can’t beat them, join them!